Yes, that is not chickpea flour and not tofu! Just some good old red lentils (masoor dal). Red Lentils are soaked for 15-20 mins. Then blended with water, spices, baking powder, kala namak. The veggies are cooked slightly with spices, then distributed in the pan. Then the lentil batter is spread on top. Bake and done! Chickpeas and chickpea flour are the in thing these days. They are easily available too. Often, I want to use other beans and lentils in the recipes but end up using chickpeas. Its because of the ease of availability and the familiarity of the readers. Red lentils are coming up right behind chickpeas. Easily available, super quick cooking, protein filled and delicious. Try this frittata with red lentils. 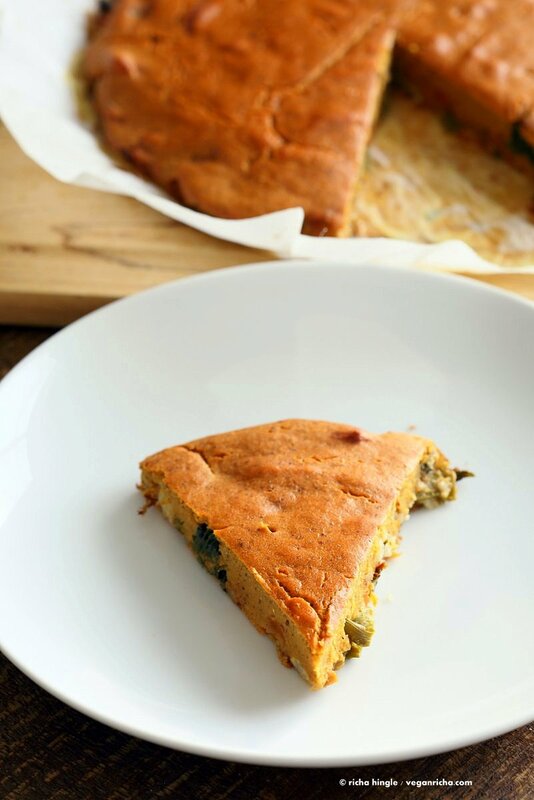 You can also use the chickpea flour mixture from this Broccolini frittata, or use this lentil batter in the broccolini frittata for variation. You can also use moong dal (split and skinned mung beans) or a mix of red lentils andmoong dal to make the batter. 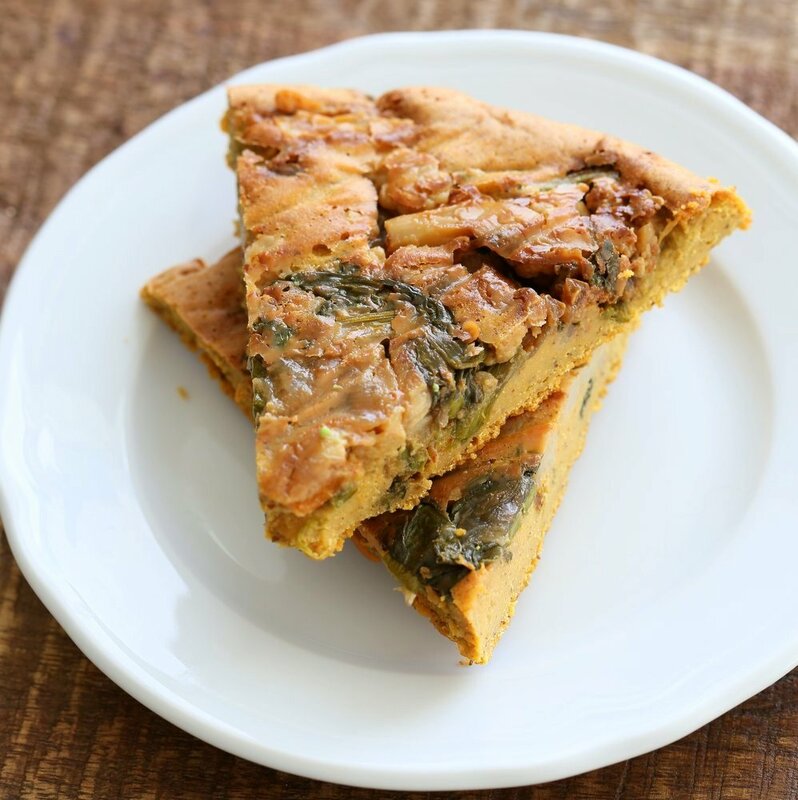 Make this into a quiche by using a prebaked quiche crust. Add spices and blends of choice. Fold in some smoke coconut (coconut bacon). Get baking! Transfer to a parchment lined pan. Blend the lentils with the eggy mix ingredients and pour over the veggies. Use a spatula to even it out. Bake until golden. Serve with sauces or dressing of choice. Lentil Veggie Asparagus Frittata. 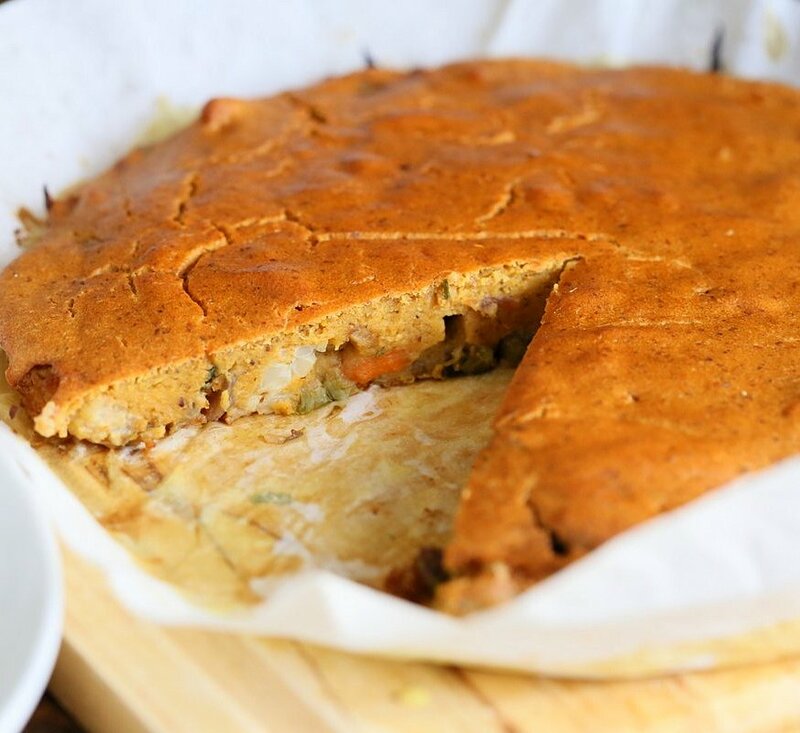 Blended red lentils make the egg in this lentil frittata filled with Spring vegetables. 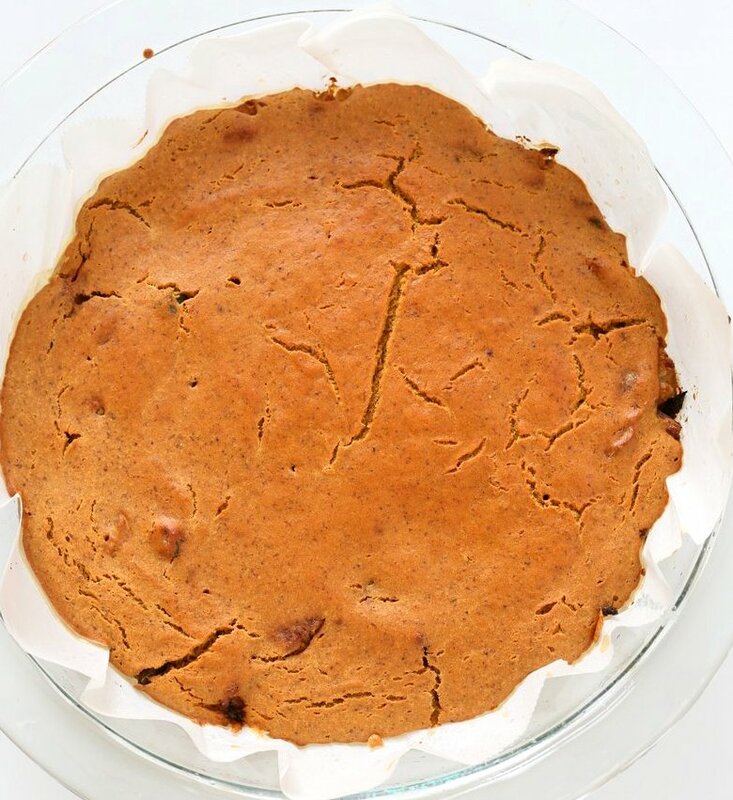 Easy Vegan Gluten-free Soy-free Recipe. Makes 1 8 or 9 inch pie or cake pan. 2 cups (1774 g) chopped veggies. I use a cup cauliflower small florets, 1/2 cup chopped carrots and some red bell pepper, peas, mushrooms etc. 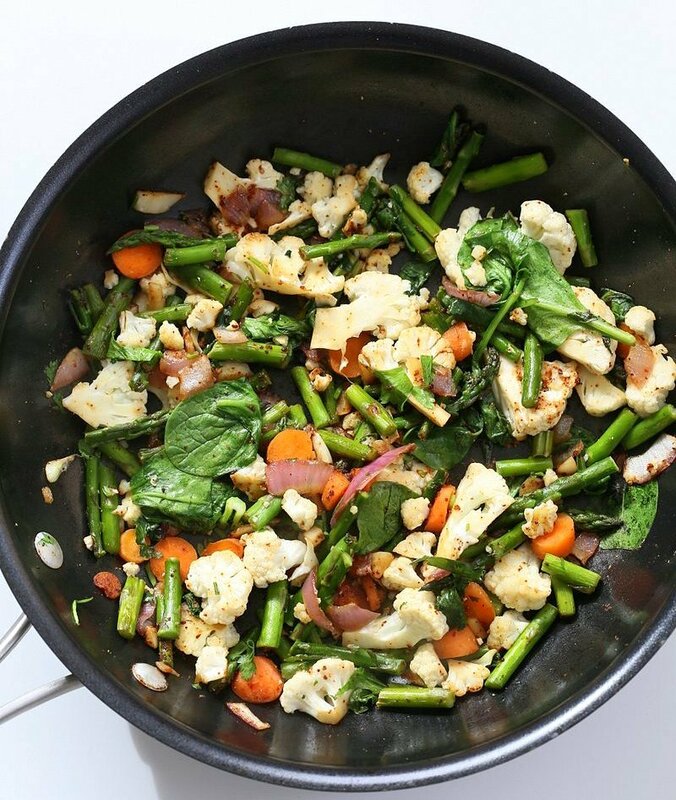 Chop up the veggies and keep aside. Heat oil in a skillet over medium heat. Add onions, garlic and cook until onions are translucent. 3-4 mins. 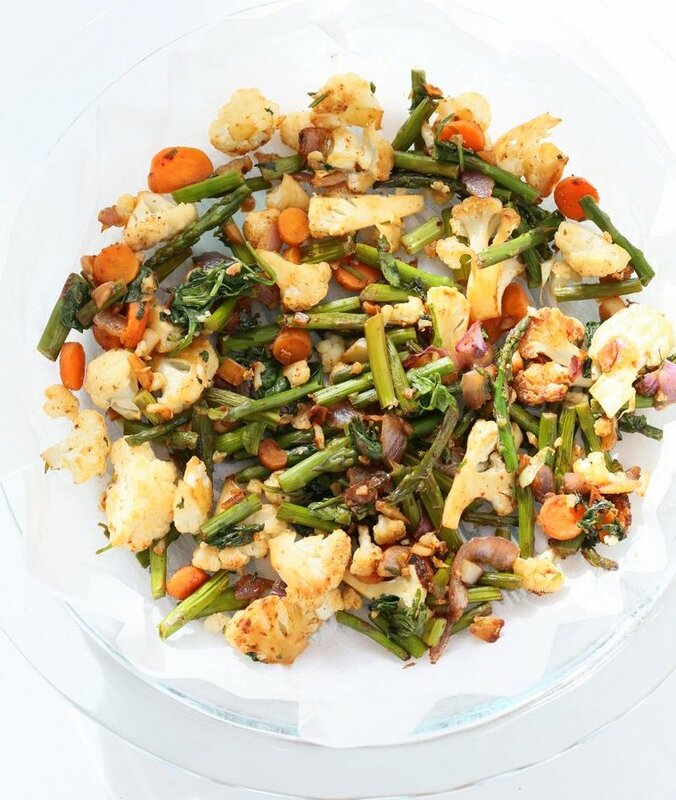 Add the asparagus, cauliflower, carrots and other veggies if using and mix in. Cover and cook for 2 minutes. Add in the spices, greens and mix in. Cover and cook for 2 to 4 minutes or until the greens are wilted. Take off heat and Let it sit covered for another minute. Drain the lentils and blend with 1 cup water. Blend for atleast a minute. Add the almond flour and the rest of the ingredients and blend until smooth. I blended 2 full 50 second cycles in the blendtec. Transfer the veggies to the parchment lined pan. Mix in vegan cheese shreds if using. 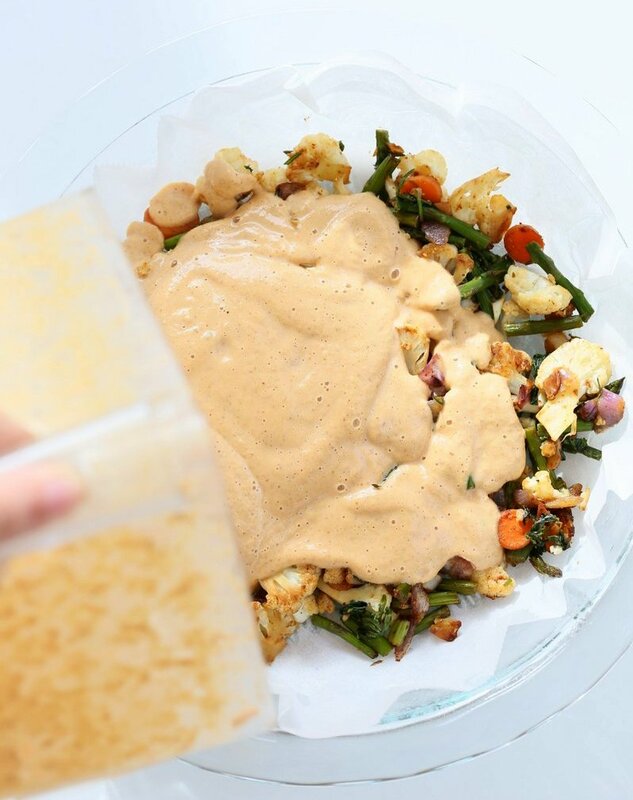 Drizzle the lentil mixture on the veggies and spread with a spatula. Tap once or twice so the mixture settles on the veggies. Bake for 40 to 50 minutes until a tooth pick from the center comes out almost clean and not wet. Cool in the pan for 10 mintues, Then cool on the cooling rack for another 5-10 before slicing. Serve with avocado and sriracha or other sauce, chutney or dressing. Variations: add chopped sundried tomatoes to the veggie mix. Add vegan cheddar cheese shreds or other vegan cheese, mix into the veggies. Really creative! 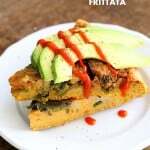 This is great way to transition to vegan food! 😀 I hope so. I think someone who isnt already vegan or vegetarian might find the ingredients a bit odd, lentils for the egg 🙂 . This is such a great idea! This has given me some great ideas. Thanks for your inventiveness!! Pinned. Richa, This looks and sounds as if it will be fantastic, I will be giving it a try. This looks INSANE. I love this idea! Just ate it for dinner It was AWESOME!! So different. The veggies were phenomenally spiced and the topping was creamy. So filling, too. I soaked my lentils in boiling hot water for about 45 mins and it pureed perfectly. It was such a terrific out-of-the-box recipe.. Thanks for being so great at recipe development!!! Awesome! So glad you loved it! Yes the lentils should make a creamy custardy base which is flavored a bit like an egg. it works amazingly even without the kala namak for the egg flavor as I love lentils any which way! Gosh this looks amazing. Planning it for breakfast tomorrow! Wow, I can’t wait to try this! I’m thinking bday brunch this weekend! How necessary is the almond flour, or any flour for that matter. almond flour expands a bit during baking. it adds a bit of volume to the lentil mixture, like a lighter volume in the overall dense lentil batter. you can make your own almond flour, blend some almonds until they are a coarse meal and use. Something very different and perfect for dinner here. And, a portable. we plan a couple of outings soon. We eat diffently and to have another for our joint recipe book is just lovely. You have just solved a problem! Oh my god. Made this for dinner tonight and it is AMAZING!!!! I had to omit the nutritional yeast and Kala Namk as I couldn’t get them but it doesn’t change the fact it tastes great! 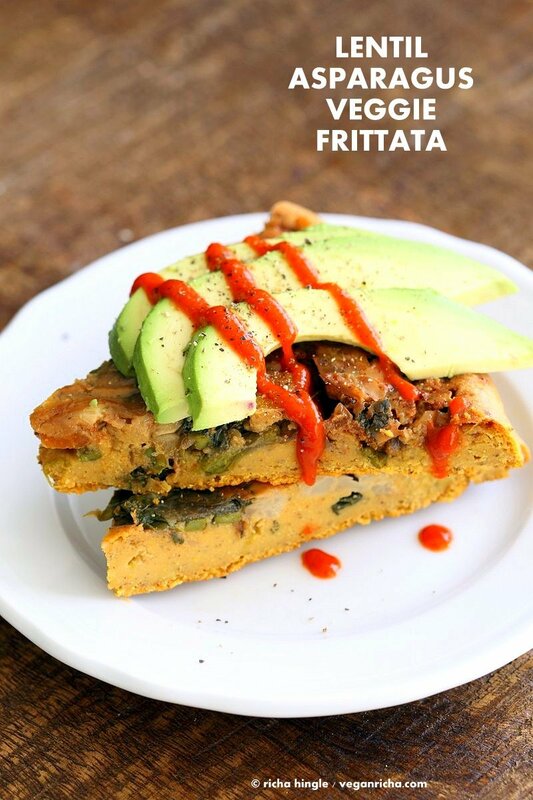 I used to love Frittata before I became Vegan and this is a great alternative!!! Awesome!! Yes there is a lot of flavor in the lentil batter. So glad you loved it! Thats Awesome! Thank for trying the recipes and loving them. Made it, loved it, making it again on Friday – this will become a staple in my kitchen, I can’t thank you enough!!! What could I use instead of sun dried tomato? I don’t tolerate them very well. Richa, thank you, thank you, for such a fabulous recipe. I was looking for a healthy and filling breakfast dish and this fits exactly what I was looking for. Although, this dish works well for lunch or dinner also. You are a genius. I never would have thought to soak the lentils and puree…love it. Look forward to trying your other recipes. Thanks again! Awesome! Thats a fab idea to brush the sundried tomato oil. so much flavor! Do you think this could this be made ahead and hold up to being refrigerated or frozen? I was thinking of making ahead for a camping trip where I could reheat but won’t have the blender handy… This looks delicious and I have a bunch of vegetarian friends I’d like to be able to share with on the trip. yes you can bake it and take it along. it can stay refrigerated for upto 3 days. longer frozen. Thanks for the awesome reportoire of recipes! Love your blog! yes yellow mung will work perfectly. This is phenomenal! Made two this morning – had to omit the chipotle powder, oregano and asparagus to use what I had on hand – smoked paprika, dill and spinach. It was divine in spite of the substitutions – wow Richa you knocked this out of the park! We absolutely LOVE this recipe. I’ve run into an issue however. We’ve just discovered that my son does not tolerate almonds well. Is there another flour (nut or other) that would work in place of the almond flour? cashew flour or pumpkin seed flour should work. My partner is on a low FODMAP diet and can’t eat red lentils, could canned lentils be substituted do you think? both lentils are the same family. so i am not sure if it will work. you can try it out with canned lentils. puree them to a thick batter to use. the baked color might be brown grey. want to try this for my new Vegan Cooking Club. One of the girls can’t have almonds. Can I swap almond meal to cashew meal? Thats awesome! so glad everything i turning out well! Richa, please, what is recommended baking temperature? Can starch be substituted somehow, for example for millet (flour)? 365 degrees F. It says in step 1 to preheat. Hi Richa, This dish is quite unlike things I usually make but I made it last night and everyone loved it! Wished i’d been a bit more generous with the chipotle (had to use sauce as i didn’t have powder and i was a bit timorous!). Thanks for inspiration! awesome! 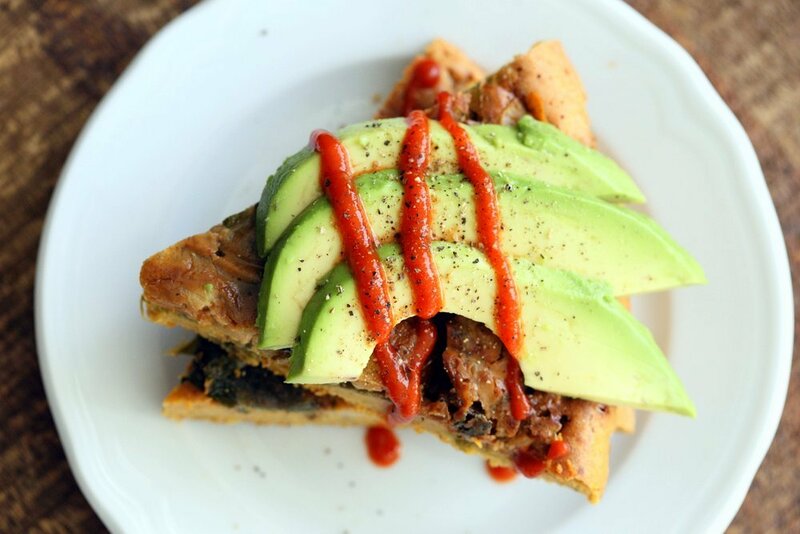 you can drizzle some sauce on the slices before serving. Do you think that white bean flour could be used as an alternative? How could this affect the recipe? White beans work in quiches and cheeses, so this shouldn’t be impossible. Your white bean and broccoli fritatta is outstanding, by the way. I havent use white bean flour. i think you have to use it like chickpea flour batter. in this one cooked beans would be a better sub for the lentils. I have just made this and it is DELICIOUS! I am already looking forward to making it again. Thank you for your amazing recipes. I made this last night and loved it! Can’t wait to have leftovers for lunch. This was easy to make and turned out perfectly. Light, fluffy and cheesy. I didn’t have almond flour/meal so I used oat flour instead. For the veggies I used what was in the fridge-shiitake mushrooms, brussel sprouts, potatoes, asparagus and red bell pepper. Hubby and I loved it and are looking forward to having leftovers tomorrow. Thanks Richa you’re the best! Richa, do you have any suggestions for making this dish ahead of time? I want to serve it for lunch on Easter but won’t have much time that day. I am thinking of cooking the veggies the day before, and refrigerating them overnight. Can I pre-mix the batter and refrigerate it overnight, then assemble all the ingredients just before baking? Thank you! i made this yesterday its yummy !!! i added sundried tomatoes and some sugar snaps too and used chilli flakes as didnt have any chipotle . plus added some cumin too . and i did use kala namak – just had one for my breakfast cold . Would thoroughly recommend to anyone here who hasn’t made it yet -MAKE IT ! will definitely become a staple for me ! thank you !!!!! can i freeze it ? Could I use this as a quiche filling?